The last time San Diego State played against nationally ranked No. 13 Stanford, it pulled off a last-minute, come-from-behind upset. This time, however, the Aztecs, plagued by mistakes and lack of a passing game, lost 31-10 Friday at Stanford in the season opener. 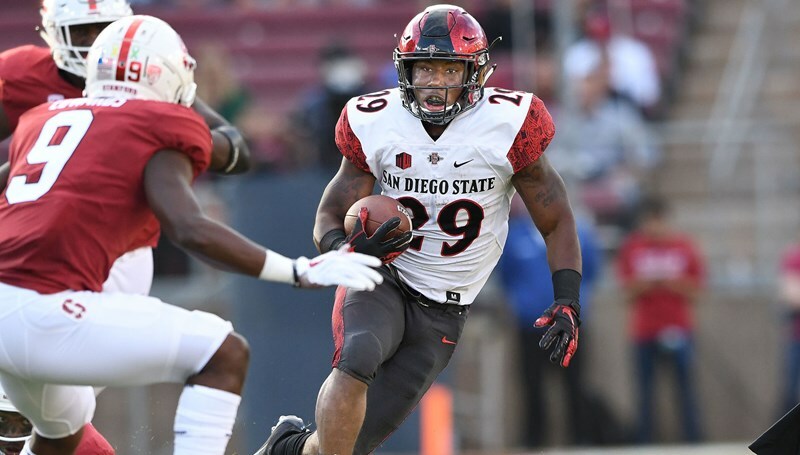 Aztecs (0-1) defense was doing all they can to contain running back Bryce Love, a Heisman Trophy runner-up who finished last season with 2,118, that they forgot about wide receiver J.J. Arcega-Whiteside. That was a costly mistake. While Love was held to 29 yards on 18 carries, Arcega-Whiteside caught three touchdown passes from K.J. Costello. Arcega-Whiteside would end the night with six catches for 226 yards. San Diego State has a great first quarter, putting pressure on the Cardinal’s (1-0) running game and scoring first. Christian Chapman connected with Juwan Washington on a 4-yard touchdown pass. The junior running back ended the night with a career-high 158 yards on 24 carries. After an unfortunate safety in the second quarter when Chapman held on the ball for too long, the Aztecs had a chance to end the first half in the lead but instead squandered the opportunity. Senior defensive lineman intercepted a Costello’s pass was batted in the line of scrimmage. Hall tried to run upfield but was hit from behind and fumbled. The Aztecs next face Sacramento State in a home opener on Sept. 8.